This makes a beautiful meal... A flavoursome salad with the beautiful aroma of fresh seasonal basil and garden cherry tomatoes paired with creamy gluten free quinoa noodles. This is one of my favourite ways to eat the rainbow in pure plants! It's all about filling your bowl with a variation of plants and drizzling an epic dressing on top! For this bowl, I choose a creamy almond and coconut vinaigrette - and it was amazing! The perfect summer coleslaw with an amazing creamy vegan dressing! A wonderful alternative to bread! Millet and Quinoa are two of the most alkalising, gluten free grains which is why I choose to make this loaf. It is both filling and delicious! Thai lovers! This is such an easy salad to make with a beautiful burst of flavour! The perfect lunch or dinner and a great way to eat a variation of raw veggies! The sweet chilli and ginger dressing on this raw Thai salad is delicious! Raw foodies! This is an amazing addition for your recipe books.. 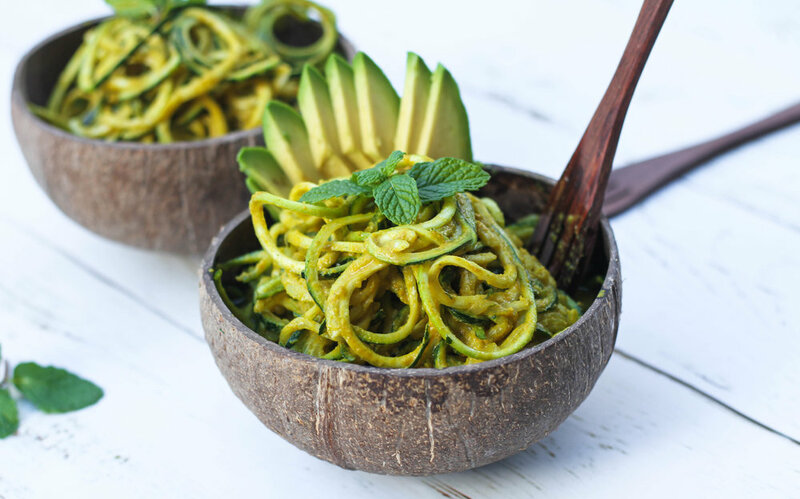 Inspired by Fully Raw Kristina, these noodles are both delicious and refreshing with a sweet curry flavour. I wanted a salad that included all of my garden greens and had an amazing flavour. After creating this beautiful salad, I became a little obsessed and made it over and over! The creamy dill dressing, black olives and splash of coconut aminos make it a definite kitchen keeper! I was in my home town of New Zealand when I created this salad and it was a big hit with the whole family! The almond parsley dressing is amazing and with the toasted pine nuts and sesame seeds, raw noodle salads don't get much better! Packed with a variety of raw nutrients, this tasty salad is an amazing addition for your Thai cook books! Light, refreshing and super tasty! Paired with Guacamole and freshly shredded cos lettuce, these herbed sweet and tasty wedges quickly became one of my favourite things to eat! Who loves freshly made basil pesto! The aroma from the fresh basil is so beautiful and when combined with steamed red skin potatoes, it's a sure family favourite! I made these for my family and they absolutely loved them! Amazing in a buddha bowl with a dollop or coconut yoghurt or even in as a burger patty.. The best family sized pizza base! This would have to be one of the most easiest, gluten free vegan pizza bases to make!